Since it was enacted, the Affordable Care Act (ACA) has been a source of controversy among many Americans. However, according to Gallup’s polls, a majority of Americans feel that the law has had no effect on them. Since the beginning of 2014, more Americans are reporting that the law has affected them-- either positively or negatively. 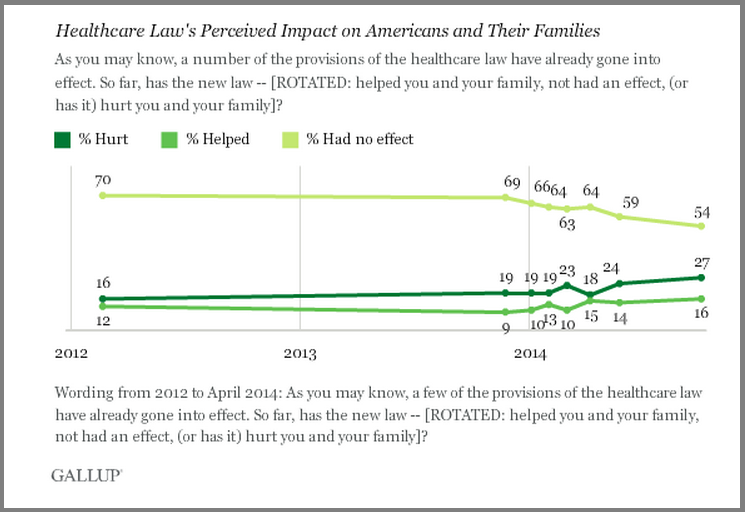 Here are the results from the latest Gallup poll on Americans’ perception of how the ACA has impacted them. The Gallup poll results are based on telephone interviews with 1,014 adults (18 and older) conducted on October 1, 2014 through October 2, 2014. The margin of error is + or - 4 percentage points. Interviews were conducted in English and Spanish on landlines and on cell phones. The percentage of Americans who report that the ACA had no effect on them has dropped from 70 percent to 54 percent since 2012. However, more Americans report that the law has hurt them (27 percent) than helped them (16 percent). Attitudes about the ACA’s impact remain sharply divided dependent on the respondent’s political affiliation. Individuals who identify themselves as Democrats are more likely than Independents or Republicans to report that the ACA has helped them. The percentage of individuals who reported that the law has has no effect on them remains similar among all political affiliations. 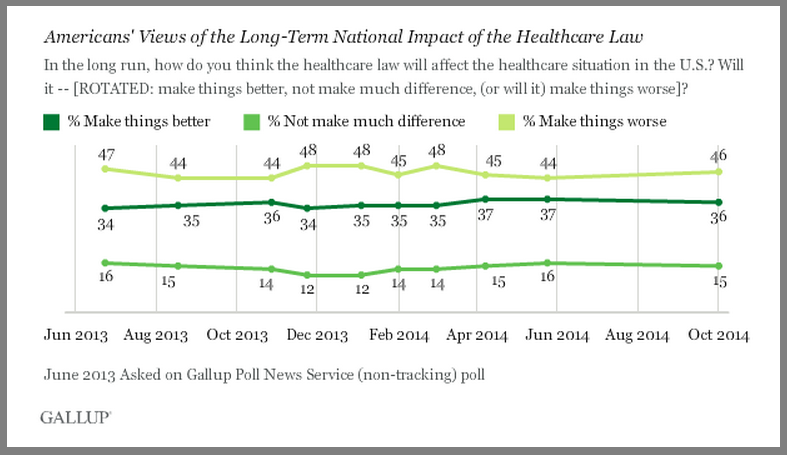 Americans’ views on the long-term effects of the ACA have remained fairly stable over the past year. The views remain more negative than positive. Read the full poll results at Gallup.